There are so many great ways to earn extra money on the side these days. By performing a simple online search, you can find tons of options and tips to help you get started. However, there’s one major obstacle people are forgetting to mention. You need quite a bit of time and energy to side hustle effectively. If you are trying to pay off your debt, save more, boost your income so you can invest more, or meet any other goal, you’ll want your side hustle to be sustainable and no draining. If it’s not, you’ll find yourself burning out too quickly. At the height of my side hustle experience, I was working 15-20 hours per week on top of 40 hours per week at my day job. I could have easily burned out regularly but I found ways to optimize my time and energy so I could continue to earn more money. 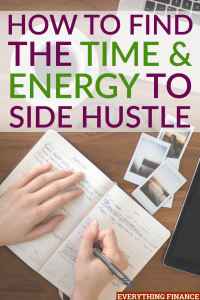 Have you found a side hustle you’re interested in but just need to find the time and energy to get started? These tips will help you. The first thing you want to do when you start side hustling is to get organized. This way you can prioritize your time and energy. It’s important to know exactly what you need to do and when you can do it. Determine when you’re most productive and set aside a dedicated time for side hustle work. You can also use a planner and make a daily to-do list to stay on track. Don’t forget to plan out work that is unpaid and determine how you’ll do it effectively. This could be things like taking time to promote your services, answering emails, transporting yourself to your side hustle location, or even sending out invoices if you freelance. We all waste time one way or another. When you side hustle, your goal should be to free up as much time as possible. So, you’ll need to cut out certain activities that could hinder your progress. Usually, watching excessive amounts of television is the first thing to go. If you’re watching television for two hours every night, that’s 10 hours you can free up during weekdays. Even if you cut that time in half, you’ll still gain 5 hours. You may also want to cut out time spent on social media basically doing nothing or time spent playing games. You can also start meal prepping your food for the week to cut spent making dinner, or outsource laundry services. If all you do is read articles online during your lunch break, trying working on your side hustle instead. Basically, figure out some of the activities that take up a lot of time in your life. Then see which ones you can streamline or get rid of. This way you can have more time to side hustle. I always recommend either one of the other to side hustlers, because generally, you can’t pick both. You’re probably either a morning or night person. I’m definitely a morning person. I can’t think to do anything super productive at night when I’d rather just relax and spend time with my family. To get more work done when I side hustled, I chose to get up at 5 am most mornings. That may sound crazy to some, but if you’d rather sleep in and stay up later to side hustle in the evening, you can do that as well. When you chose one or the other, it should line up with your productivity levels allowing you to get even more work done. I know some people who can get a ton of work done at night and that’s what suits them. Just find what works for you. To add to my last point, I wouldn’t recommend that anyone significantly cut their sleep hours just to side hustle. You need at least 7-8 hours of sleep each night on average. This is crucial if you’re working a ton of hours between your main job and side hustle. I know that when I don’t have enough sleep at night, I get cranky and unproductive at work which wastes more of my time. If you follow many of the tips above, you should be able to know when it’s time to quit for the night to get some much-needed rest so you can be prepared to take on the following day. You can always finish up what you’re doing the day after. Nothing feels worse than getting off work at a job you feel lukewarm about then doing another job you dislike. Since you spend so much time working, you might as well love your side hustle since you’ll spend a decent amount of hours on it. Plus you have to realize, the type of work you do can greatly affect the energy and motivation you have to get it done. If your day job doesn’t allow you to be as creative as you’d like, try a creative side hustle as an outlet. Determine what your skills are and what type of work you’d actually enjoy doing. Choosing a side hustle that excites you and that you’re good at could make all the difference in terms of you making time and energy to work on it. Plus, it can also be good for your health. Do you have a side hustle? Have you struggled with finding more time and energy to work on it?